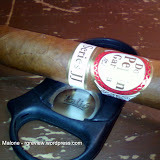 This cigar was recommended to me by my local tobacconist, Cigary International (great shop). 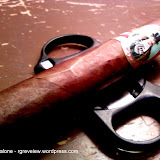 It is the 6.25 x 52 box press El Toro; with a Cameroon wrapper, a Dominican and Brazilian filler, and a Nicaraguan binder. 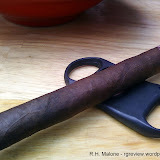 The cigar looks great, it is a nice oily cigar with minimal veins. Additionally, the band is very nice looking. Prelight: I could smell a very nice creamy, earthy, woodiness. 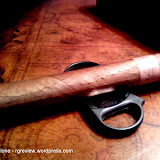 The prelight draw was nicely firm for a box pressed cigar, which was spot on. As I was lighting the cigar I thought that, “man, what a good burn”. The burn edge was like a straight edge, perfect. Then I took my first draw and I got something I wasn’t expecting, smoothness with medium strength. There were loads of smooth woodiness (I was transported back to Colorado and my past back packing trips) with a slight hint of nuttiness. It was such a good taste I started “smoking it hot”. What a horrible mistake. 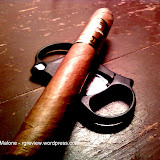 The cigar turned very, very quickly to a leathery/bittery taste. Really not good. I thought the cigars taste might have turned, but when I let it rest for a bit the woodiness with slight nuttiness came back. Awesome. Ok, retro-hale time. Then BAM, intense flavors of spice and cinnamon. Fantastic, good “Nicaraguan” tastes. This is turning out to be a great smoke. 1 inch in and the ash is looking good, 75% white and 25% black, a nice whitish pepper. It should be noted that this cigar doesn’t produce a lot of smoke, but the burn was still straight and true. Going with my very slow method I started to notice nice cedar with a slight floral note along with the woody/nuttiness. Between 1 and 2 inches in I forgot to go slow and, sure enough, it started turning bitter. However, as soon as I let it rest a while all the wonderful flavors came back. 1/2 through the cigar and I decided to retro-hale again. This time there was still a nice spice, but the cinnamon had been replaced by a honey note. 2/3rd through the cigar and I tried to remove the band. This proved very difficult and I slightly damaged the wrapper as I was trying to remove the band. Bummer. The flavors stayed constant throughout the damaged area. It was time for another retro-hale and this time the spice was more intense with a nice grassy notes. It should be noted that the flavors have been very intense throughout, but no one flavor overpowers the other. Additionally, the strength has been medium throughout. There have been no relights even though I was smoking this cigar very, very slowly. Which is what I would recommend, as I have mentioned before, as the cigar goes bitter pretty quickly. 2 inches left and something totally unexpected happened. The tasting notes have turned to notes of; burnt toast, grass/wheat, and anise. I was really taken a back. For a cigar that I thought would be straight forward, I couldn’t have been further from the truth. 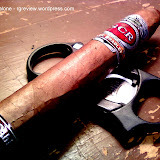 I would give this cigar a rating of 8.5. 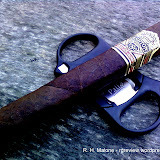 It was a fully bodied complex cigar with a medium strength. Really a great smoke. I highly recommend. 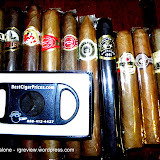 The cigar runs about $7, depending on location.